Reprinted from: "2019 Student Engineer of the Year," Wiliki o Hawaiʻi: Engineer of Hawaiʻi, February 2019, Vol. 54, No. 12, p. 1-7. 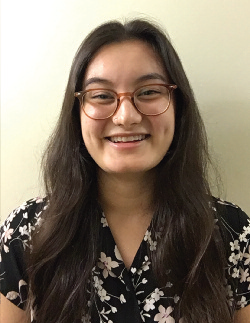 The 2019 HCES SEOY award goes to Ms. Sasha S Yamada of the Electrical Engineering Department, College of Engineering (CoE), University of Hawaii at Manoa (UHM) and is expected to graduate with a BS EE, specialization in electrophysics, in the Spring semester of 2019 with an overall GPA of 3.93/4.00. Sasha is a proud 2015 Kahuku High School graduate who is a first-generation college student. Within Sasha’s first month of enrolling at UHM, she joined the Liquid-Metal Electronics team. Within this team, she has investigated the feasibility of using liquid metal to create reconfigurable circuits which has given her the opportunity to work against the force of gravity. The liquid-metal pixel was later used in the design of a frequency-reconfigurable dipole, which Sasha fabricated the prototypes and tested. Her contributions to this project secured her a place as second author of another paper in the International Journal of Antennas and Propagation. Outside of UHM, Sasha has dedicated her summers to pursuing stateof-the-art technical experiences. In 2016, she was selected as a Nakatani Research and International Experiences for Students (RIES) Fellow and spent 12 weeks doing nanomaterials research at The University of Tokyo under the advisement of Prof. Yoshihiro Iwasa. As a rising sophomore at the time, this experience introduced her to advanced topics like condensed matter physics and 2D material synthesis. It also taught her how to navigate situations involving cross-cultural communication and gave her the opportunity to observe how culture can influence scientific perspectives. In 2017, she returned to Japan as a visiting undergraduate researcher at Tokyo University of Agriculture and Technology (TUAT), where she simulated optical confinement in silicon waveguides in the Shimizu Laboratory. In 2018, she interned in the Antenna Systems Department at The Aerospace Corporation in El Segundo, CA. There, she designed a wideband antenna for an RF-photonic transducer, and performed comprehensive literature reviews about deployable antennas and the effect of reentry plasma sheaths on RF communications. Sasha has also been actively involved in student organizations and is currently Chair of the Institute of Electrical and Electronics Engineers (IEEE) Student Branch. Within this role she has prioritized hosting technical workshops to give students more opportunities to expand their technical skill sets. She is also a member of the Society of Women Engineers and the Delta Omega chapter of Eta Kappa Nu (the electrical engineering honor society). Sasha was also a member of the 2017 IEEE International Microwave Symposium Steering Committee and assisted in the organization of an all-women panel session with the theme of “Inspiring the next generation of women engineers.” She has also served as a Student Representative on the Holmescoming Steering Committee for the past three years, where she was responsible for coordinating 150+ students to volunteer at the annual event. After graduating from UHM, she intends to enroll in an Electrical Engineering PhD program to learn more about a field that has fascinated her for the past four years. Her ultimate goal is to stay in academia and become a professor. She hopes to promote the involvement of women and members of other underrepresented groups in STEM.